Professional Practice Policy-67 sets out requirements for pharmacist-supervised injectable hydromorphone maintenance treatment within community pharmacies. This policy aligns with “Guidance for Injectable Opioid Agonist Treatment for Opioid Use Disorder" developed by the BC Centre on Substance Use. The Guidance document expands the continuum of care for opioid use disorder. It provides treatment options for individuals who have not benefitted from opioid agonist treatment, which includes the oral medications, buprenorphine/naloxone, methadone and slow release oral morphine. 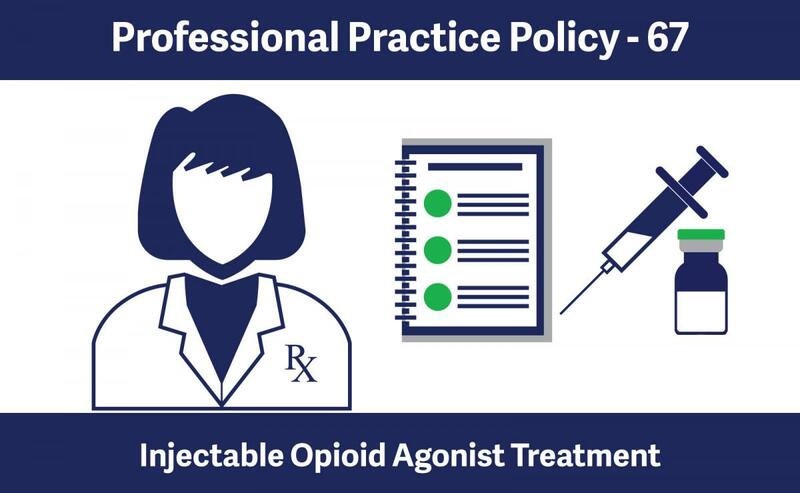 Professional Practice Policy-67: Injectable Opioid Agonist Treatment and the accompanying Policy Guide for Injectable Hydromorphone Maintenance Treatment complement the College’s existing opioid agonist treatment requirements. Professional Practice Policy-67 and the accompanying Policy Guide for Injectable Hydromorphone Maintenance Treatment were approved for implementation by the College Board at its June 2018 meeting and will be in effect as of September 1, 2018.